The Rangers have Toronto tonight in a game that is probably going to be incredibly lopsided. The last time these two teams faced off, the Rangers won 4-1 with Alex Georgiev making 55 saves. He recently said he “hopes to face fewer shots.” I laughed for two reasons. First, it was funny. Second, he might still face 60 shots. Jesper Fast might be shut down for the year. Ditto Chris Kreider. Marc Staal didn’t practice either. The lines are a bit of a mess. The Leafs, meanwhile, are a well oiled offensive machine. They give up a good amount too, but they are a top offensive team in the league. Without the fire power to match, this could get ugly fast. Frederik Andersen gets the start. Crazy Prediction: Georgiev faces 20 shots in the first, quits in the first intermission. 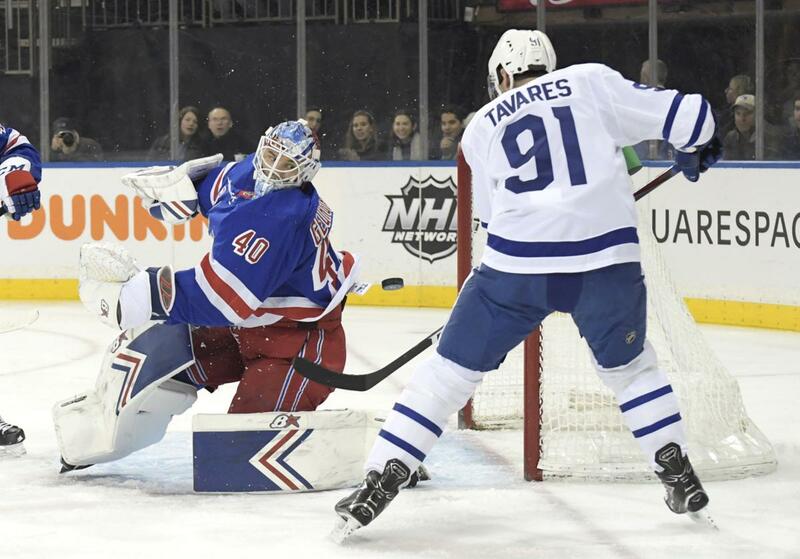 Toronto is reeling and handling pressure badly once again right now, Rangers could steal one tonight. TO defensively is a mish mosh so normally I would agree, but our lineup up front looks like it’s missing a whole 2nd line and the first is worse off for the loss of a healthy Kreider … plus our 3rd pair d’ scares the hell out of me. I would be happy with a nice 3-2 or 4-3 loss in regulation with Georgiev stopping 35-45 depending on the above scores. I don’t care about Georgi’s win loss record, just want to see him top .910 save percentage by the end of the year. Can’t win a game if you’ve got your hands around your own throat. Toronto just lost 6-2 to Ottawa the other night, who are thinner than NYR across the board right now. On any given night … a very off night. The Rangers showed lots of energy in the opening period. Chytil doesn’t look out of place in the pivot position. He seems to play better when he gets more touches on the puck. Lias looking more comfortable out there as well. Gilmore with a couple of unforced errors but he has wheels and makes crisps passes. It will be interesting to see the roster with 2-3 players on emergency call ups the rest of the way. Hate to call myself a prophet, so I’ll just leave it at that. Good call, prophet. This was back to how we played a few weeks ago, determined effort vs a more talented opponent. The points hurt for the draft, but help in another way, as you could see by the player reaction after the winner (and Mika’s little jig on the way to the locker room!). Oh, and I’m really liking Lemieux, he wins 1-on-1 battles, fights in front of the net, good presence on the ice. He played great but we didn’t need any points! I’m gonna say it again. Georgi just might be the Crown Prince. Gonna be some battle between him and Shesty next season. He was fantastic. Leafs kryptonite. One will be gone unfortunately. He is patient and he’s a big sponge soaking up all he can learn. The 2 big saves were the hops from 150’ away , wow those 2 bounces were crazy! Well he made a bunch of great saves and rebound control made things way easier for himself. Way better then Spooner , Gorton has made some good moves , probably his best for this season so far. If only Sather would step completely away ! Georgi is starting to show he can make the impossible save every now and then. I would love to see him and Shesty as a tandem …. this is, problematic. Funny you say this, because I was thinking the same thing during the game last night. It will be interesting to see how the Rangers handle this, and when I say “this,” I mean Hank. I know … and I don’t want to be a blasphemer. As big of Hank fan, apologist, Hank man crush, whatever you want to call me, this is still a business and I see that Hank could be “in the way” of progress going forward. But the real issue is, can the other 2 move forward without him for a full season? The answer, based on the former back Ranger goalie HOFamers is NO. Because, as I have said for many a time, it’s one thing to get 15 – 20 starts a year and be dominant as opposed to being the guy for even 40 games. Bottom line? Benoit Allaire is the Rangers’ MVP. His record is superior and off the charts. He’s done it with just about every goalie that has come through here. He may be the best coach the Rangers have ever had in their history, based on his responsibilities. Shesty and Georgie should play tag as to the #1a and 1B in Hartford and 2A and 2B in New York. Let them both see action in both places to keep them busy. Not sure about contracts, waivers, etc – but that would be the best case scenario for one year. I don’t think that Shesty would be willing to play in Hartford after playing in a pro league. But it will be very interesting to see what happens. Agree about Benny, he’s the best. Georgi has played 28 games so far, I don’t think his numbers would be all that different at 35 or so, maybe even 40. he went long stretches without playing a game, so fatigue (mental or physical) wouldn’t seem to be an issue. Same record and save % as Hank, relatively. Can he be a durable #1? Unknown, but there is only one way to find out. Remember, he isn’t Talbot or Raanta, he’s just turned 23! Re: Shesty, he doesn’t seem like the type of guy who would want to sit too much time on the bench or playing in the AHL …. and can we blame him? He dominated the KHL for years, he’ll view the AHL as a step down. Sure, some time to adjust is to be expected, but a whole season or two in the AHL? Not happening. If we’re truly committed to a rebuild I would say Hank’s situation has to be resolved after next season. We can probably play around for 1 season of Shesty’s career, but no more than that. Hate the 2 pts but love the effort and energy. Very good win for the kids, who were under manned coming in. For those who decry the “go to the net” mantra, it seems every time that Buch does it he’s the player that everyone thinks he can be. So guess what? It works!! He’s a core player next year. And I’m starting to feel, even though I think it might be Kreider, that this is Zib’s team now. He will be 26 going into next year and would be perfect to lead a young team going forward. Have to agree with you on all points Tony. What a nice game by the team, they played tough against a very good team an won. I might not like the 2 points much but the boys loved the win and that is important. Georgiev was brilliant again. The kid can flat out play and now that he is playing regularly he has been very good. He is only going to get better. Peter, did you see the reaction of the team at the end? Just great. There’s 8.5 million reasons why Hank will still be playing! It’s not even that, he has to agree to go, which he will not. I think that you are one to something my friend, lol. What both you, and Tony are saying is correct, and in spite of the win last night, we are in 5th position from the bottom in the draft order. I couldn’t help but laugh seeing Sather in the sky box seats last night, with that turd in his mouth!!!!!! But I think the Rangers have games in hand with the Ducks, so that’s not good.